Claim: this is a photo of fossilized Irish giant discovered in 1895. 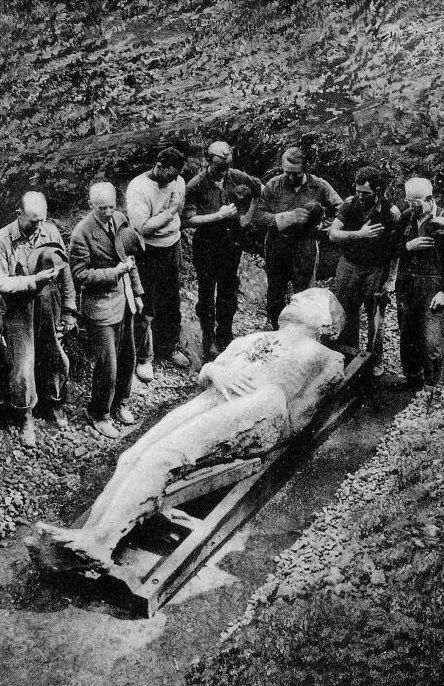 That is actually a papermache replica of the so called Cardiff Giant, one of the most famous hoaxes in American history. The giant was the creation of a man called George Hull. He was eventually sued and on February 2, 1870 both giants were revealed as fakes in court. Of course it’s fake. Why would these men place their hands on their hearts to a complete stranger?! ?